One Owner, Local, Trade-in, Non-smoker, Certified, Low Mileage! Boasting with multiple smart safety features, an excellent range of engines all of which are great performers and unmistakable styling, the Santa Fe Sport is simply an all in one package. This SUV is a proven capable off road warrior that is timid enough to be civilized and refined on the road. With a spacious cabin, and multiple modern options as standard, the value for money is at a high level. Look no further, the 2015 Santa Fe Sport is your new versatile SUV.This low mileage SUV has just 31500 kms and is a Certified Pre-Owned vehicle. It's twilight black in colour. It has a na transmission and is powered by a 264HP 2.0L 4 Cylinder Engine. It has a certified used vehicle warranty for added peace of mind. Our Santa Fe Sport's trim level is 2.0T Premium. Upgrade to this Santa Fe Sport Premium and you'll be treated to premium features. It comes with an AM/FM CD/MP3 player with SiriusXM, an audio aux jack and Bluetooth streaming audio, heated front seats, a heated leather-wrapped steering wheel with audio and cruise control, dual-zone automatic climate control, aluminum wheels, fog lamps, automatic headlights, and more. 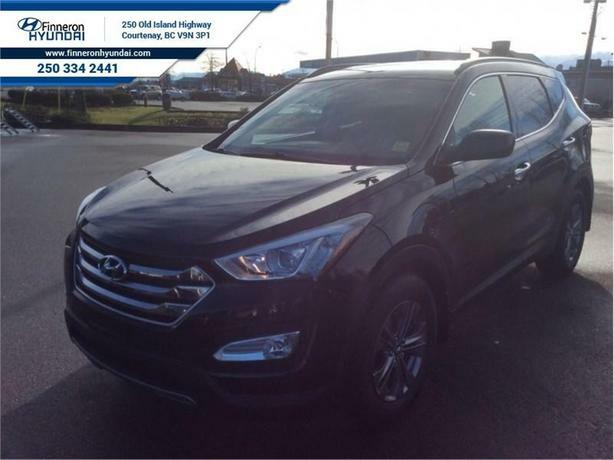 This 2015 Hyundai Santa Fe Sport is for sale today in Courtenay.